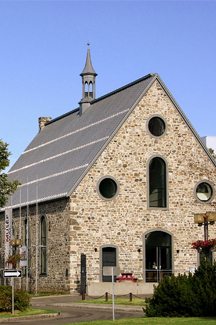 Located on the banks of the St. Lawrence River in the oldest stone church east of Quebec City, Museum Rimouski is dedicated to contemporary art, regional history and sciences highlighted through exhibitions, permanent collection of artworks and artifacts, educational activities and events. This summer, the Museum presents Melanie Authier’s paintings – Contrarieties & Counterpoints, Geneviève Chevalier’s video between art and nature – Bord d’attaque/Bord de fuite, and Quebec myths and legends with the exhibition Histoires fantastiques. antastiques.